SWBAT add mixed numbers with like denominators. I begin this warm up by showing this video from the link below. It's a nice transition back to fractions. I have been gone for four days and my students participated in a short geometry unit with the guest teacher. This video is a short, and engaging video and gets students back into thinking about fractions. I especially like the review component of this video. The review is a nice way to re-engage my struggling students. George, Dylan and Eli were hungry for dessert. Eli ate 2/8 of a pie, George ate 3/8 of a pie and Dylan ate 4/8 of a pie. How much pie did the boys eat altogether? How many whole pies did I need to feed the boys? How do you know? Justify your answer using pictures, numbers or words. How did you determine how much pie was eaten? Are all the answers the same? o Can 9/8 and 1 1/8 both be right? o How do you know that is more than one? How can you write 1 whole piece as a fraction? How do you know how many whole pies I need? · Will there be any pie left? The purpose of taking an inquiry approach is to structure learning so that students can tackle problems, generate possible solutions, share and improve each other's ideas, and demonstrate their understanding in a variety of ways. The end goal of inquiry is that my students develop a deep understanding of key ideas and concepts or adding mixed numbers in this activity. The purpose of strong mathematical inquiry is to get students thinking, acting and working like mathematicians, not just doing math. This movement from students 'learning math' to students 'learning to think like a mathematician' can be a difficult concept to understand and one that continually needs practice and my attention. The solution is not immediately obvious. The problem provides a learning situation related to a key concept or big idea. The context of the problem is meaningful to students. The problem promotes the use of one or more strategies. The situation requires decision making above and beyond the choosing of a mathematical operation. The solution time is reasonable. I make sure to tell students that the red examples are only examples and they are welcome to use them or think of other mixed numbers that have a sum of 5. Students work with their learning partners to work on the problem. As students work, I circulate around the room listening and observing students. Some students ask me what to do, or what numbers to use, and I have to concentrate on my questioning and guiding their thinking without giving them answers. Notice in this video a student asks me right away if he is right. My response is, " I don't know. Can you model it to find out?" In this particular video, I wasn't able to get the partner dialogue that happened prior to this, but the student talking in the video is really wrestling with this idea of adding mixed numbers. His partner is confused and is thinking of a mixed number like 4 1/4 as 4 x 1/4. This led to some interesting discussion between the two and clued me into addressing this misconception with other groups as well. And in this video you can see a pair of students explaining their strategy as they come up with a rule and conjecture about adding mixed numbers. Towards the end of the video I ask one of the students in the partnership to show me the strategy because I was concerned that the other student had "taken over" the activity and that the other student was merely copying him. I love in the video when you hear the student supporting the other student, saying, "Come on, you got this. You were just doing it." While I know that the first student does have more complex skills and understands fractions at a deeper level than his partner, I loved the learning from both students in this activity and the level of support they gave each other. To end this lesson, it is imperative that I help students make connections with how to add mixed numbers. To do this, I have students share the strategies that worked for them. During the activity while I circulated around the room, I observed and looked for students who excelled at finding a pattern or students who used models to solve the problem. It is important that I have students show more than one strategy during the wrap up discussion in order to reach and connect with as many students as possible. 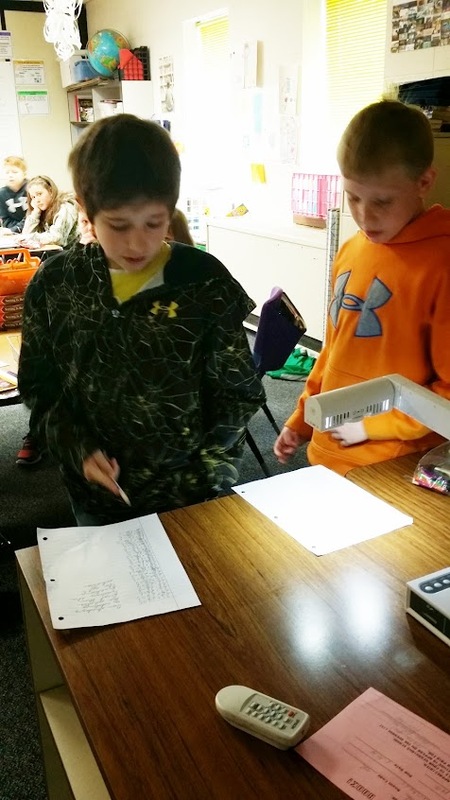 In this photograph, you can see two boys sharing their work under the document camera for all students to see as they talk about the strategy they used to solve the problem. In this photo you can see the two boys again, but notice the other students looking intently. 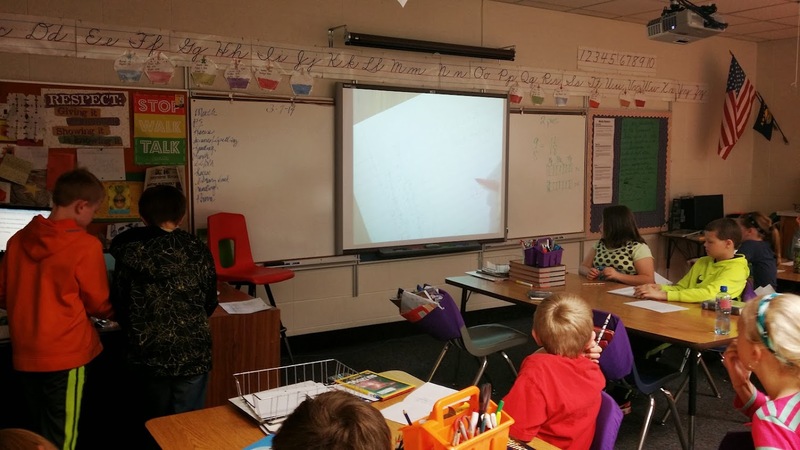 Having students share they thinking by using the document camera in an excellent engagement strategy as well.